The tram crosses the city’s many streets and houses, the tyres screeching several times as the tram gets pushed uphill and back hill to change tracks (the tram to furnicular track). A lady I befriended in the tram told me she regularly took this tram and advised me to sit on the other side of the window for a view. I was blown away! Trieste is unbelievably gorgeous and as the tram keeps moving up the views get better. The last stop is The Obelisk from where Trieste and its panoramic splendor can be seen. The minuscule red houses and expansive Bay are so picturesque. Important Info: -One way cost of the tram is EUR 1.1. -Tram runs from 7:00 a.m. to 8:00 p.m. -Best time to go is early morning or late evenings. -Pack a picnic and relax at Obelisk. UPDATE: As of October 2017, The Opicina Tram is no longer in operation. Instead, take Bus 2 for a scenic journey to Opicina. great photos! I’ve never heard of this tram and I’ve passed thru Trieste many times! Thanks Tanja 🙂 You must visit the next time then! 😀 😀 I am glad I am making the list longer, its fun! That is so sweet <3 I just read it and makes me feel so good. Thank you! Definitely on my to do list! Wow… and what made you decide to go there if I may ask? I mean because it is kind of off the beaten track as they say.The city looks beautiful. Is it a city that can be easily walked, or do you need to use public transportation? Ciao Rae 🙂 I decided to visit it when I saw some pictures of its “Grand Canal” 😉 Its totally a walking town with Austrian and Hungarian history. Very stylish place. You will like it. A trip of a lifetime? Beautiful images! Again, your travel is so important to me as an artist, “soothing to my sour.” Thank you for sharing. I got it 😉 I really appreciate you coming here and saying that. Many thanks! How wonderful! 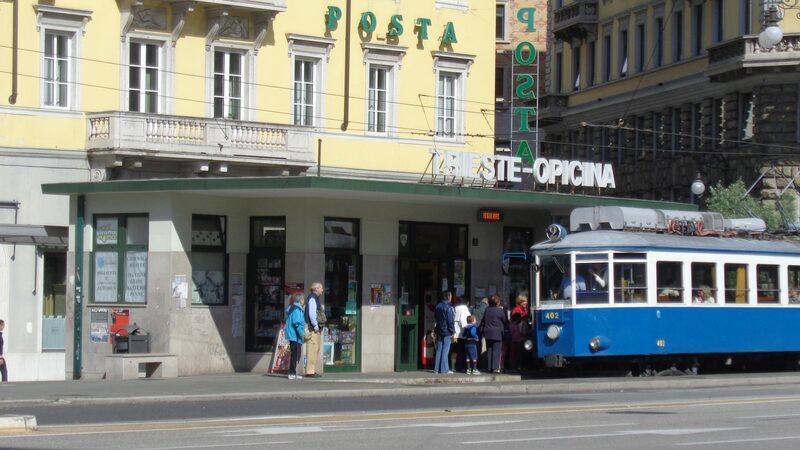 Trieste is a beautiful city and when I return there I’ll definitely try out this tram. Thank you Francis. Do you not stay in Italy? Have you been to Trieste? It is a cog railway, actually. Next time, enjoy the 3.5k walk from the Obelisk to the village of Prosecco, along the so-called “Napoleonica”, at sunset. Breath-taking views on the Gulf galore! You’re welcome! And don’t be afraid about windy weather. The most common feature of Trieste is “bora”, a very fast wind that may reach 130 km/h (average speed is 70-80), you can’t say you know Trieste until you experience some bora days (people use to say that bora is born in Senj, gets married in Rijeka and dies in Trieste). Ciao! Thank you so much . I love the name 😉 triestina! Il check the link. Do you stay in Trieste? I’ve lived in Ljubljana, about 100 km away, all my life till 2.5 years ago, and yet I’ve never taken this tram or took a photo of Trieste from this high. Thank you! Wow. How fabulous. The best way to experience a place is with the locals. Your photos are beautiful. Love the view–isn’t it fun to explore these “alternate” ways to get around and see the sites? Funiculars are terrific! It really is 🙂 I love these offbeat things to do! I have never been to Croatia but I hope to visit someday. I saw Pula is a fascinating town. Thanks for commenting, Dave 🙂 Il check your blog too! Lovely photos, and I’m happily familiar with that view. The walk along the Strada Napoleonica is gorgeous, just as the tram trip is. I moved here almost 3 years ago and have never regretted it. The city is small enough to be comfortable and large enough to feel like a city, and so very walkable. When the bora blows, have some coffee inside. Thank you for your lovely thoughts all the way from Trieste. If I am ever there, il give you a ping 😉 I loved Trieste and would love to come back. You’d be most welcome! I hope you’ll be able to return someday. I love the book and the place. You are welcome. Loved that post of yours 🙂 Cheers! An excellent enticement to visit. So well presented. Thank you. Your marvellous blog tempts me to plan my trip to Trieste soon! The beautiful description of your tram experience, the place and the splendid clicks leaves me spellbound. The beauty of the place makes me think how beautiful God has created this world. Thanks for introducing us to such an eye-striking place. Thank you Anandan 🙂 that is so sweet of you. I feel floored. Hope you can visit it someday.